It’s back down to earth with a rather exciting bump. Forget all those exotic locations of the previous few posts, I am now back in the UK, shivering in the snow, and looking forward to the next stage of my writing journey. The good news is I have a publication date – 1st August 2018. I now feel I have entered the world of a proper writer – no longer an imposter. I have an editor (it takes a professional to realise that when I was waffling on about the beginnings of a beard the word I was actually looking for was stubble….) and hopefully very shortly, a book cover. For the last few years I have been lucky enough to have had a lot of time to concentrate on my writing ‘hobby’. I was an empty-nester, my fledglings had flown and we had moved away from our friends and family in the UK to live in the Netherlands. I didn’t have a job, and with only a relatively small circle of new friends and acquaintances, I had an awful lot of time on my hands. A more sociable person might well have gone mad at the thought of the long lonely day stretching ahead once their other half had left for work each morning, instead I sat down at my keyboard and wrote (although I may have gone just a little bit crazy at the same time). 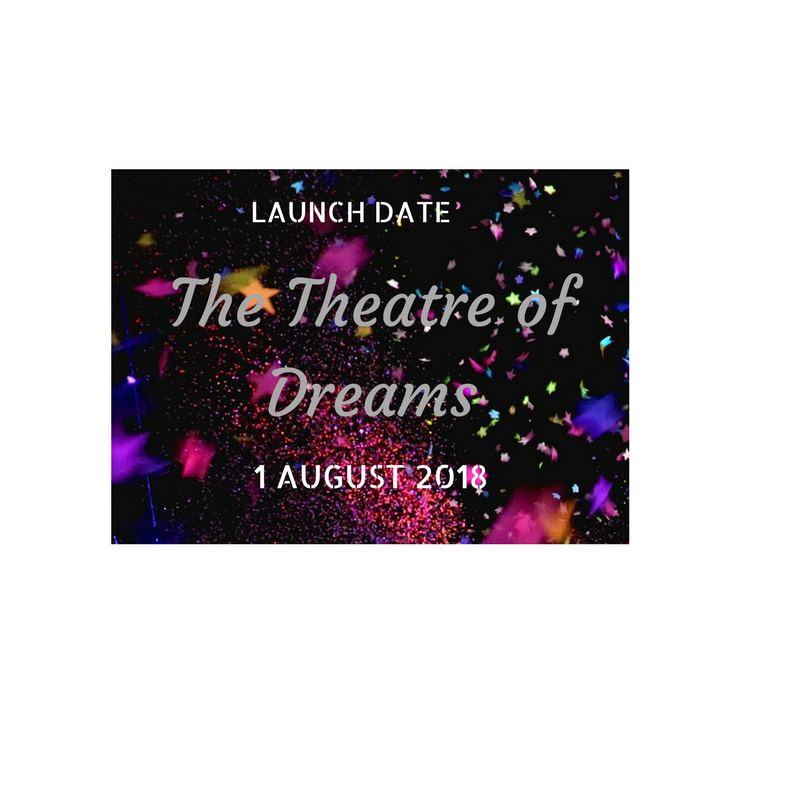 So while I am still basking in the celebrations of having a publication date, I am also having a few palpitations at the thought of the road ahead and all that it entails. I will be stepping out into unknown territory. I’ve never been very good at conversing with strangers, I’m the shy, retiring type, but the upside of social media is that I don’t actually have to talk to people face-to-face about my upcoming publication. I can hide behind my Twitter profile, create a whole new persona on Instagram, and re-invent myself as the bubbly, vivacious author of an entertaining romantic comedy that will tug at your heart-strings and make you smile all at the same time. Of course I have to be aware of potential sales figures, but right now I’m still on my newbie-author high. It’s extremely satisfying (and also something of a relief) to know that a publisher has put their faith in me and my writing, and believes that I have produced something that other people will want to read. Posted on March 7, 2018 | by Rosie Travers | Leave a Comment on Paradise Found? We came in search of paradise and found crocodiles in the creek and stingers in the water. 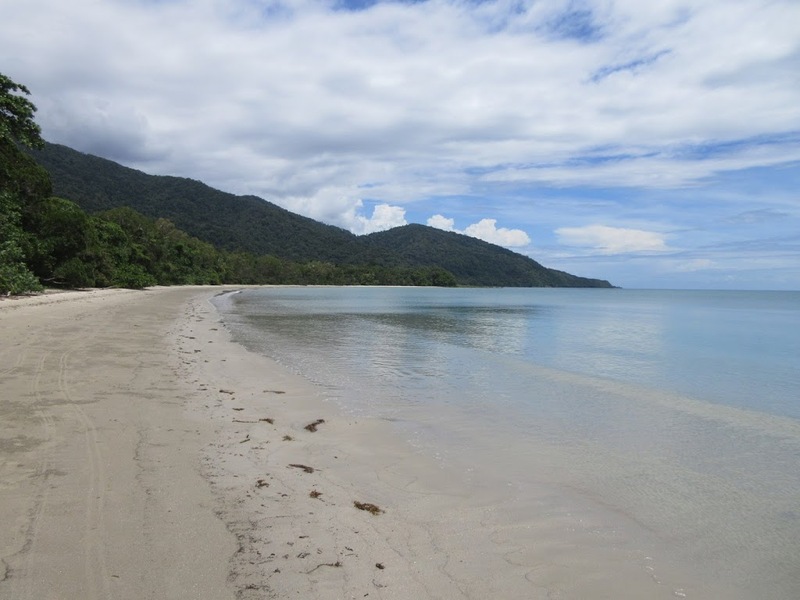 Attractive as it may look, don’t be deceived, the North Queensland coast offers a bevy of lethal hazards. At first glance, the beaches are idyllic, icing sugar soft sand and clear turquoise water, set against a backdrop of tropical palm trees. But those crystal clear waters are home to venomous jelly fish – one lash from a transparent tentacle and your number could well be up. 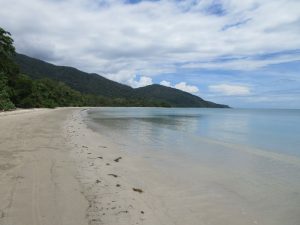 Swimming areas are cordoned off with nets but during our four day stay at the picturesque resort of Port Douglas even the safe zone had been infiltrated by those pesky little stingers and swimming from the beach was off-limits. For our snorkelling trip to the Great Barrier Reef, the main reason people head up to this treacherous part of the coast, we were kitted out in ‘stinger suits’ – a glamorous protective all in one complete with gloves and hood (fortunately there are no photographs available). We had booked a day trip on the reef which took us to three different locations and included an underwater safari with a marine biologist. Snorkelling in the GBR is equivalent to being immersed in a tropical aquarium; the water is warm and the fish are abundant, in all different shapes and sizes. We saw turtles, a stingray but thankfully no sharks (another Queensland hazard) and definitely no jelly-fish. If swimming in a stinger suit had not been exciting enough the following day we booked a discovery tour of the Daintree Rain Forest, which is apparently the oldest rain forest on the planet, and set off cross country to search for the elusive Cassowary, a large emu like bird which hides out in the bush. Sadly the Cassowaries remained elusive, as did the crocs who inhabit the Daintree River. This is not the time of year to see them basking on the banks instead they lurk in the muddy waters, ready to pounce on unsuspecting tourists. 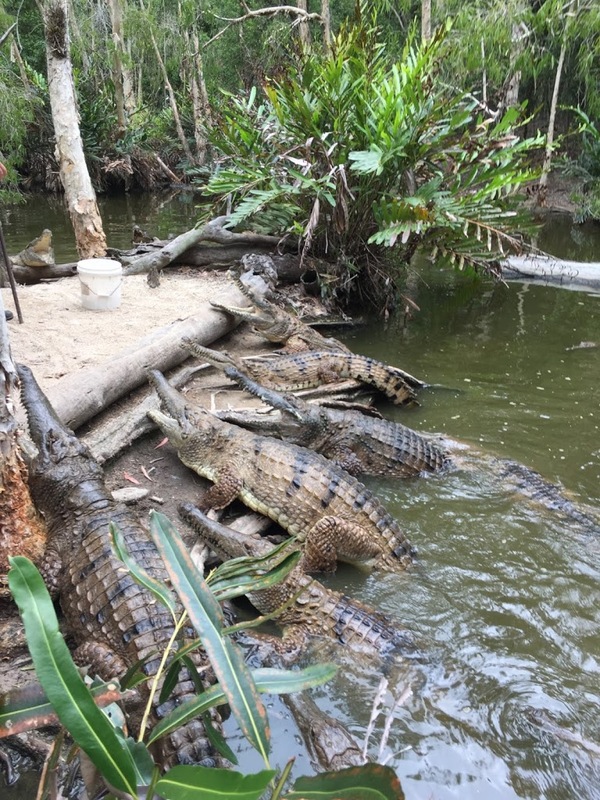 We later encountered some captive crocs in action at a local wildlife park & I have to say I didn’t feel I missed out at all by not meeting one in the wild. Being able to see animals in their natural habitat has definitely been a highlight of our trip. 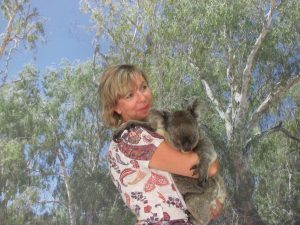 Ok so I did fulfil a childhood ambition of cuddling a koala, which is only legal in Queensland and South Australia and a no-no absolutely everywhere else, but in my defence I did convince Mr T he really didn’t need to sample a wallaby burger or a crocodile steak (he was tempted) although we both ate plenty of very tasty local fish. How do you reconcile the joy of finding Nemo hidden amongst the anemones on a coral reef to tucking into a barramundi? It’s a difficult one. If there was another creature I didn’t want to encounter in Queensland it was the mosquito, but alas, despite lavish applications of l’eau de DEET they attacked with a vengeance. A definite low, likewise the flies at Ayres Rock. Not pleasant. Our adventure down under has almost reached its end. Now it’s just a question of packing our cases one last time in order to squeeze in those last minute souvenirs. 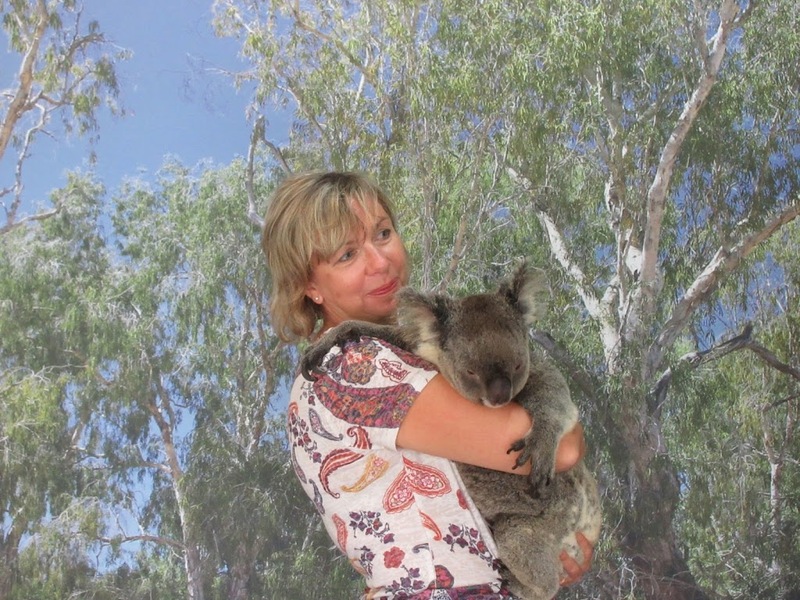 I just hope the koala doesn’t wake up as we go through security….